Jello is a Java Application Framework optimized for Google App Engine. It boosts your productivity by letting you model the application in a more declarative fashion so you can focus on the business logic and see instant results. Data Access Control (DAC) is an important aspect of any data oriented solution. 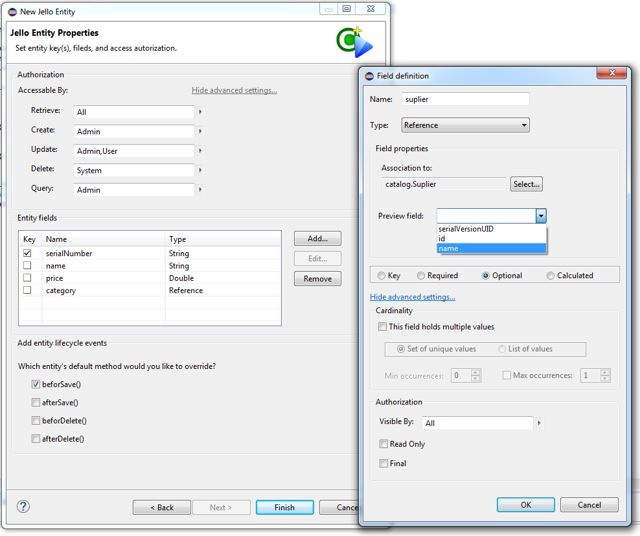 One of Jello's key features is its inline Authorization Model. With Jello you can assign different access levels for data elements and specify who is authorized to access the data. Jello lets you expose your data model via OData service. OData (Open Data Protocol) helps you focus on your business logic while building RESTful APIs without having to worry about the different approaches needed to fetch and interact with the data. Jello provides UI views out-of-the-box so you can test your application and start interacting with the data instantly. These views can also serve as Admin UI and can be easily extended by adding custom controls. The Jello programming model is based on inline declarative annotations. It provides a programming model that takes care for the application "plumbing" so that you can focus on the application-level business logic and be more productive. It includes everything you need, from the database entities to the Admin UI views. Get started, build your first application. A Jello based application is essentially a web application running on Google Cloud in an App Engine Java container. Jello leverages all App Engine services and they are all available for you, including the Local Development Server and the Google Cloud Engine dashboard. With the Jello Plugin for Eclipse, you can create an application and test it in a matter of minutes. Follow the instructions in the step-by-step getting started guide and build you first application. The Jello programming model is based on inline declarative annotations. With Jello you describes your application's business model and define the data access control within the same terminology. All the business entities you define with Jello are stored in the database and get exposed via RESTfull API (OData). In addition, Jello provides UI views out-of-the-box, that allow you to test your application instantly. We strive to keep the framework as clean and declarative as possible and to reduce dependencies to the minimum. Nevertheless, we did not want to 'reinvent the wheel' either. so, wherever it makes sense, we based the implementation on other well-established frameworks and infrastructures. This allows us to deliver a lightweight, yet super flexible and powerful framework. While Jello offers a clean and an amazing productive programming framework, it does not dictate its model and you are not forced to solely follow its paradigm. You can choose to develop your application from scratch exclusively with Jello (and you will find it super easy), but you can also use Jello to extend an existing JAVA application running on Google Cloud Platform.